The 2 Dragons online slot with 5 reels and 20 adjustable paylines developed by EGT is available to play for free at NeonSlots. The slot is themed to Ancient China, this is why the pictures of dragons, emperors and so on often appear on the reels. Besides regular symbols, the slot comes with Wild and Scatter symbols which activate a free spins session. Also the slot invites you to double your win in the gambling game or hit the progressive jackpot. The free spins round is activated after simultaneous Scatter symbols featuring the silver dragon appear, on the reels. When it happens, you are awarded 15 free spins. To start them click the Start button. The reels spin automatically until the free spins are played. The bet does not change during the free spins round. During the free spins another set of reels with a large number of the Wild symbols is used. It significantly boosts the chances of forming the winning combinations. If three more Scatter symbols land during the free spins, 15 new free spins are added to the remaining number. When all the free spins are played, the winnings are added together. If the total amount of wins does not exceed the limit set in the pay table, you can double it in the double-up game. The 2 Dragons slot offers a bonus round, Jackpot Cards which is triggered randomly at the end of one of the game rounds. When this happens, a new screen with 12 face-down cards opens. Your task is to choose one card at a time to collect 3 identical suits and hit the jackpot. The bonus game features 4 jackpot levels. The prize for each jackpot level corresponds to the sum accumulated as the bonus round started. The higher the bet for each spin is, the greater your chances of taking part in the game Jackpot Cards and winning a big prize are. During the whole game at the top of the screen potential winnings for each of four jackpot levels are counted. To collect your winnings click the Collect button. When the bonus round is over, you return to the game which was active before the Jackpot Cards was triggered. 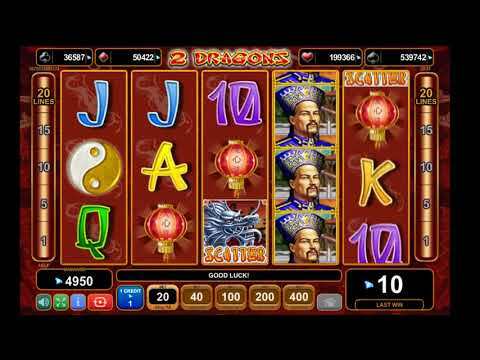 In the 2 Dragons dragon-themed online slot 3 (rarely), 4 or 5 identical symbols form combinations. The winning combination is the combo formed from left to right without gaps. If several combinations are formed after one spin, the winnings are added. Unusually, if several combos are formed on one line, only the highest-paying one pays. The online slot by EGT features two special symbols: Wild and Scatter The picture of a gold dragon is the Wild symbol. It can replace any picture to form a winning combination or to complete it. The symbol of the gold dragon cannot form its own winning combos. Note that the Wild symbol cannot substitute for the Scatter symbol. The Scatter symbol is the silver dragon. Landing of at least 3 of these symbols anywhere on the game screen activates the free spins round. The Wild symbols often appear in this round. The picture of the dragon cannot form its own combinations. Whenever the winning combo appears on the reels and the prize is awarded, you are invited to play the double-up game. The key condition is that the amount of the win for the spin should not be higher than 14,000 coins (with the maximum bet). To activate the double-up game click the Gamble button. In this round you should guess the colour of the face-down card. To make your guess, click one of the buttons: Red or Black. If your guess is right, the amount of your win for the spin activating the double-up game is doubled. Then you have another 4 tries to guess the colour of the card or to collect the coins won. To stop the double-up game click the Collect button. If your first try is not a success, the win is lost and return to the main game. Initially, in the demo version you have 5,000 credits in your account. They are converted to virtual coins to make bets. The coin value in relation to credits is fixed at 1. Your task is to increase the amount of credits in your account. You should collect winning combinations on the active paylines to increase your winnings. To activate the required number of paylines, click one of the digits found on both sides of the game screen. You should choose out of several options: 1, 5, 10, 15 or 20 lines. Note that the number of lines is fixed during the reelspin, the free spins round and the double-up game. At the top of the screen the amount of the constantly increasing potential jackpot is shown. You can open the section with the rules of the game at any time. Use the Help button to open it. The 2 Dragons online slot offers huge chances of winning a big prize. The slot features 4 levels of the progressive jackpot, the double-up game and the round of 15 free spins which can be repeated several times.